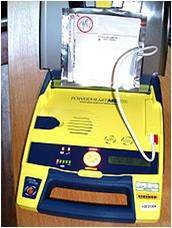 An automated external defibrillator or AED is a portable electronic device that automatically diagnoses the potentially life threatening cardiac arrhythmias of ventricular fibrillation and ventricular tachycardia in patients and is able to treat them through defibrillation, the application of electrical therapy which stops the arrhythmia, allowing the heart to reestablish an effective rhythm. As reported in USA Today, November 12, 2003 a National Institute of Health showed defibrillators can double the survival rates of sudden cardiac arrest. It is estimated that 350,000 people die annually due to sudden cardiac arrest and that in ages 15-34 the incidence has risen 10% in the last decade. (Read more about sudden cardiac arrest and high school athletes here). The first AEDwas originally designed and created by American biomedical engineer Joshua L. Koelker and Italian emergency medical professional Jordan M. Blondino to allow defibrillation in common public places. 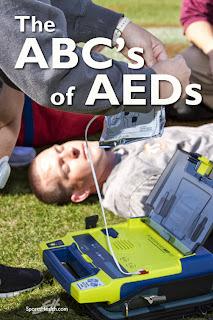 AEDs are designed to be simple to use for the layman, and the use of AEDs is taught in many first aid, first responder, and basic life support (BLS) level CPR classes in schools. In each of these two types of shockable cardiac arrhythmia, the heart is active, but in a life-threatening, dysfunctional pattern. In ventricular tachycardia, the heart beats too fast to effectively pump blood. Ultimately, ventricular tachycardia leads to ventricular fibrillation. In ventricular fibrillation, the electrical activity of the heart becomes chaotic, preventing the ventricle from effectively pumping blood. The fibrillation in the heart decreases over time, and will eventually reach asystole. AEDs will not start a stopped heart, that is, it will not be effective in a coronary attack. Its purpose is to counter a “fluttering” (fibrillation) of the heart muscle before it goes into cardiac arrest. The asystolic patient only has a chance of survival if, through a combination of CPR and cardiac stimulant drugs, one of the shockable rhythms can be established, which makes it imperative for CPR to be carried out prior to the arrival of a defibrillator. Estimates are that CPR alone is only 6-8% effective but CPR plus the use of an AED within 6 minutes is 80% effective. The American Heart Association recommends automated external defibrillators in any place where there are large numbers of people. This includes airports, stadiums, large offices or industrial buildings, public buildings and large fitness centers, for example. Several states require scholastic coaches to be certified in first aid and CPR/AED usage. In 2010, the American Heart Association (AHA) released their updated guidelines for treating sudden cardiac arrest (SCA) and heart attacks.The purchasing and placement of AEDs at schools and during athletic events is both critical and legally prudent. The American Heart Association recommendation is that an AED should be within a 2-minute walk from anywhere on school grounds/building. While emergency response plans should be developed by both physical education and athletic departments, so too should be annual “simulated episodes” requiring staff to respond to various scenarios and in various locations on school grounds. For additional information about AED usage and programs implementation go http://www.quickmedical.com/defibrillator/aha.html and Project ADAM at http://www.chw.org/display/PPF/DocID/26050/router.asp.